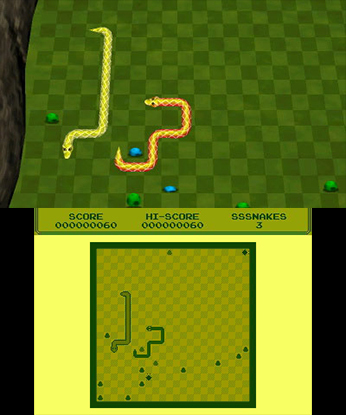 Sssnakes is a new twist on the classic snake video game. It is an upgrade for modern times without giving up its essence. Go through the jungle to the inside of the temple, avoid the traps, move through intricate mazes and face other snakes. But above all, you will need to keep away from your biggest enemy... gluttony! 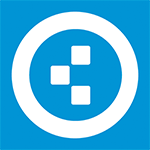 Adding fresh ideas to revitalize an old idea can yield some excellent results. However, it requires a certain degree of effort to be put in to nailing what made the original great. Only then can the solid foundation be built upon. 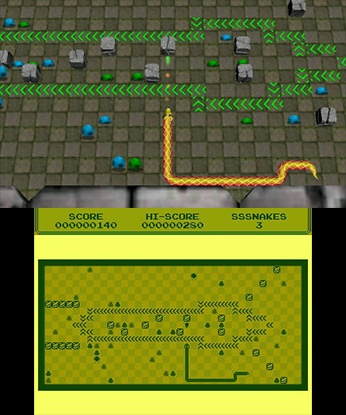 Snake games as a concept have had decades to become extremely polished, yet Sssnakes seems to ignore the lessons of the past in favour of trying new things. Sssnakes is a very basic game, and this can be a good or bad thing. It works well for those who might have limited time to play whilst on a commute, but for those who are looking for something to immerse themselves in it's definitely not that kind of game. 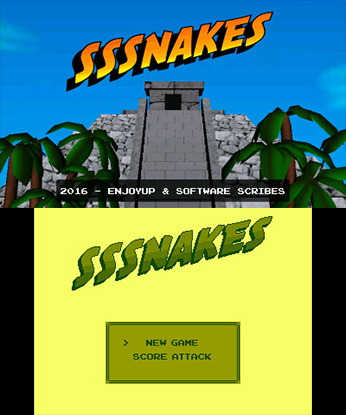 For the low price of entry it's worth having on your 3DS just to relive the nostalgia of the Nokia version, but we would not expect Sssnakes to be one you rave to your friends about. Lançar uma versão moderna de Snake é uma ideia que tinha tudo para ter sucesso e Sssnakes até tem alguns pontos capazes de o fazer sobressair, como o visual tradicional no ecrã inferior e níveis mais trabalhados. Infelizmente a execução é bastante fraca em quase todos os aspectos e mesmo contando com um preço baixo, mais vale ir à gaveta e buscar o antigo Nokia para voltar a jogar Snake.